Boy, do I wish you could reach right in this computer screen, grab hold of a Chocolate Rolo Stuffed Cookie and take a heavenly bite of wonder. Then you could know for yourself just how fabulous they are. (Which is REALLY fabulous!) Do you think one of you tech savvy types might be able to put an app together for me where readers could say something like “beam me up scottie” or “beam that cookie up, scottie” or “hocus pocus I want that cookie the mostest” or something of the sort. And then a cookie would magically appear in their pretty little hand. Now, wouldn’t that really be something. Keep me posted on your progress, won’t you? In the mean time, you’ll have to settle for my wordy description of these fabulous cookies. Which won’t be nearly as pleasing as these cookies taste. I hate to say it, but it’s the sad sorry truth. 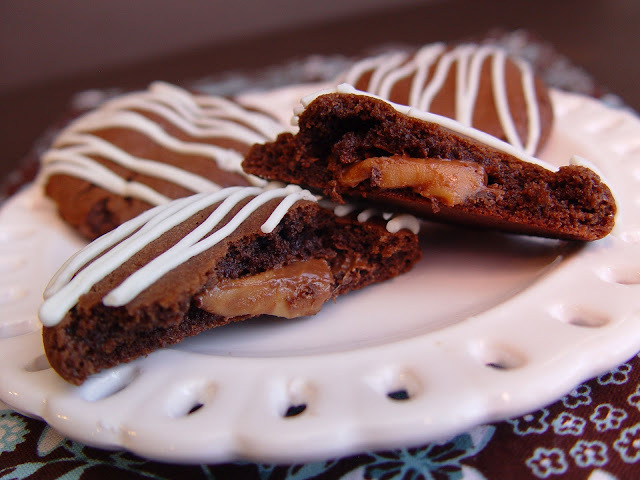 Chocolate Rolo Stuffed Cookies, my good reader…are chewy, soft and packed with rich chocolaty flavor. The inside of the cookie just melts into heavenly bliss inside your mouth, because you know what’s in there don’t you? Just a little Rolo Caramel Candy, that’s what. And Rolo Caramel Candy just might be the best chocolate candy this side of the Star Treck Enterprise. 1. Place 2 1/2 cups flour, 3/4 cup cocoa powder and 1 teaspoon baking soda into a small mixing bowl. Stir it well with a wooden spoon to incorporate all ingredients. 2. Into your stand mixer or large mixing bowl place 1 cup sugar, 1 cup firmly packed brown sugar, 1 cup softened butter and 2 eggs. Cream the ingredients together, mixing on medium speed, for about 2 minutes. Add 2 teaspoons vanilla and mix until combined. 3. Pour the dry ingredients into your mixing bowl and beat to combine. 4. Spray a large cookie sheet with cooking spray and scoop 12 tablespoon sized pieces of dough onto the tray. 5. Press a chocolate Rolo into the center of each piece of dough. Then form the dough around the candy and roll it into a ball. 6. Bake at 375 degrees for 8 minutes, or until the cookies are cracked along the edges. 7. Allow the cookies to remain on the sheet for 2 or 3 minutes, then remove them to a wire rack to cool completely. 8. Pour 2 cups white chocolate chips into a small bowl. Pop that baby into the microwave for 30 seconds. Stir and return it to the microwave for another 30 seconds. Stir the chocolate to be sure all of it is melted evenly. 9. Pour the white chocolate into a small ziploc bag. Cut a tiny hole in the tip and drizzle the white chocolate over the cookies. Jamie, my friend – you know how to get me every time! Yum! 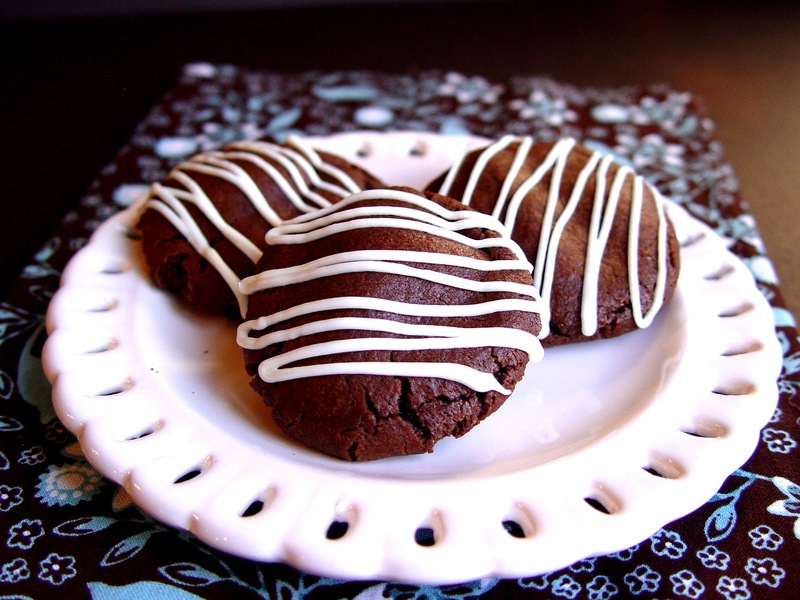 These look amazing and were definitely added to my “must make” list! Chocolate covered caramels stuffed into a chocolate cookie? Yes, please! Dove chocolate caramels would be yummy too. my hubby loves these!! we have made them from cake mixes before but i like to do from scratch. thanks for the yummy recipe!!! On my way to buy Rolos right now! Looks so yum! I made these for a party and they were delicious. I came home with an empty plate 🙂 I'm featuring these on our blog next Wednesday. Thanks for the recipe! I can't wait to make these! They look fabulous! Thanks for the heads up, yes you need 3/4 C cocoa powder. When I melt my chocolate it was always too thick even after i melted all the way through? is there anything I could do to change it? White chocolate can be tricky. If it gets even the tiniest bit of water, or liquid mixed in with it…it hardens up in a quick hurry. Also, if the temprature gets too high…it will harden up. Hope this helps! So gald your cookies were such a great hit!